A couple of years ago, I took an Introduction to Software Development class, in which we covered Unix and used Vim to write a few simple programs. I didn’t really get the point of Vim at the time; I simply thought that it was the only way to edit files in the Terminal. But after looking back and spending some more time with it, I can understand why there are so many die-hard Vim fans out there. Vim is way more flexible than an ordinary text editor. It comes pre-baked into every copy of Mac OS X and almost every version of Linux, and is but a download away for Windows users. 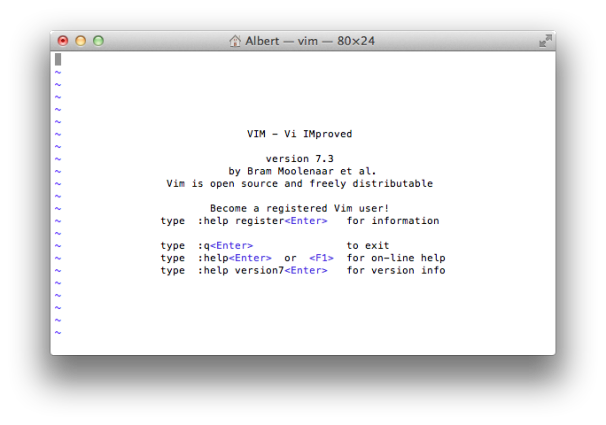 The tutorial over at Open Vim is a super easy way to dip your toe into the world of Vim. The tutorial is embedded in the webpage so even if you don’t have Vim installed on your computer, you can still learn the basics of editing using Vim. They even include two sandbox pages, environments where you can mess around and test what you’ve learned. Open Vim reminds me a lot of Codecadamy and it offers a similar experience, sans achievements. While the Open Vim tutorial covers the basics, it doesn’t really go very in depth. A great follow-up tutorial comes included with Vim. It forces you to learn to navigate in order to advance through the tutorial, and also encourages practice and experience in order to learn the commands, rather than dull memorization. If you're interested, here’s how to access the tutorial that comes with Vim: If you’re running Mac OS X or Linux, all you need to do is open a terminal window and type “vimtutor” sans-quotes and press enter. If you’re on a Windows machine, you’ll have to install Vim first, then open up a command prompt and navigate to the folder where it was installed. 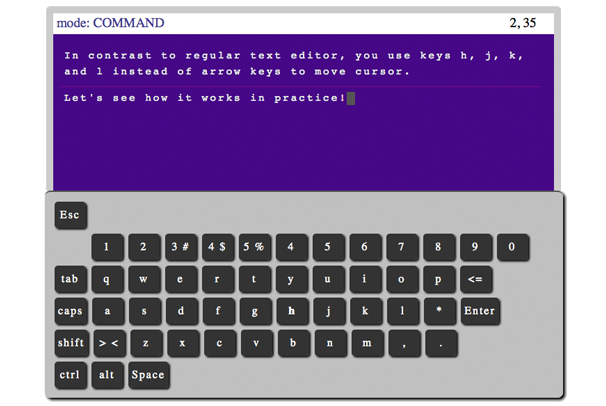 Once there, type in “vimtutor” sans-quotes and press enter. In Windows, this opens GVim, a graphical version of Vim. If you want to go old school and complete the tutorial in the console, just type “vimtutor –console” instead.